Goodness from the garden ready to take us through the fall and winter…and give as gifts. We have a really big yard that we love to work in. Steve is outside right now weeding the lavender bed. We had such a dry winter that about half of our lavender plants didn’t survive. We had a hearty few that did, plus a number of volunteers that are filling out the space. And we added a few new ones to get the bed going again. We’ve got flowers and green plants taking the places now of what were hundreds of volunteer trees when we moved in. It took us three years to pull all the maple, sumac and mulberry trees that had been allowed to take over this yard. But in the twelve years we’ve lived here, it has become our oasis. We like to say that we live in a park by a park. Like my brothers and sisters, we also enjoy growing some backyard crops. My brother George, though, is the one who really inherited Grandma Piskac’s green thumb. He can grow it. He can pickle or can it. (He makes the best dill pickles!) He can cook it. My brother Mike has also discovered gardening, which is funny because about the only vegetables he will eat are green beans and sweet corn. Interesting, that is what he grows in his backyard! Actually, Barb planted cantaloupe too. (We are looking forward to that harvest so we can wrap some prosciutto around it and enjoy it with a nice prosecco.) Sally lives on a farm now and she sends us regular updates through snapchat photos of the produce from her garden. Steve and I have our beautiful cherry tree, given to us as a wedding gift from my dad and stepmom. We have our tomato square (four plants planted new this year, and four volunteers Steve couldn’t bear to rip out). We also have another square that contains a rugged patch of untamed raspberry plants. It started out as two, but now it is an actual tangled briar of lots! We were out picking them just yesterday. We also have our scattered chives and oregano in the back which have spread from potted plants, plus our patio tomato and two basil plants. Inside we’ve got our rosemaries where they can grow all year. That’s our food garden. Somehow, the Prescott siblings have found pleasure in the garden. Nothing is better than fresh vegetables – especially those homegrown tomatoes! I think Grandma Piskac would be proud of all of us. The other great thing that some of us have rediscovered is canning. When we were little we used to watch our mom make jelly. The one I remember is crabapple. She saved all the odd glass jars that used to go through a kitchen and those would become jars of crabapple jelly, each sealed with a dollop of paraffin on the top before the lid went on. I don’t think we ever had grape jelly on our pb&js when we were little. It was always crabapple but oh my! it tasted so good. After our mom died, we sisters still made crabapple jelly. The neighbors had three crabapple trees in the yard next door and we became experts on which tree made the best jelly. At some point, we just stopped. Jana and I rediscovered the joy of making jelly when we moved into our Chicago Street house and it came with a cherry tree in the front yard. Picking the fruit, cooking it down and squeezing out the juice, it all came back. And the kitchen is just filled with that beautiful smell of cooking fruit! 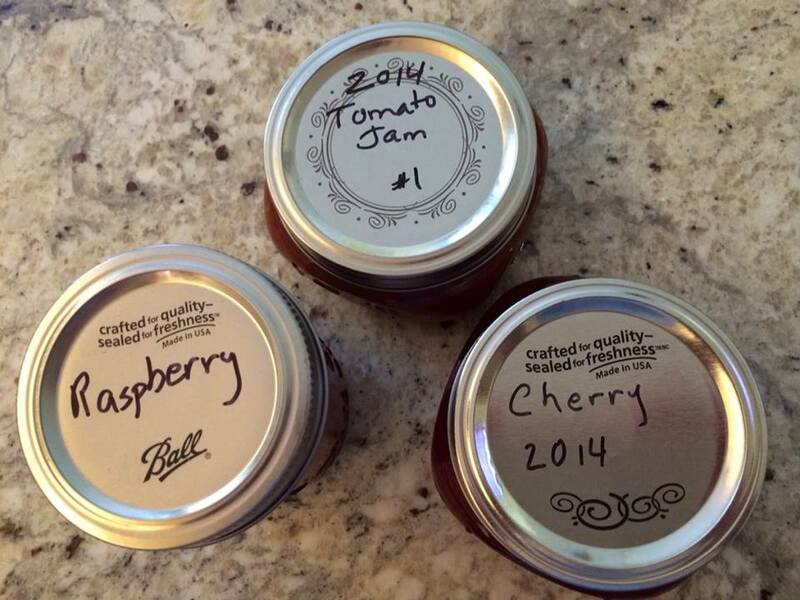 After ladling it into hot jars and putting it through the hot water bath, we labeled the jars and we were ready for the fall and winter, and we had plenty of homemade jelly for Christmas gifts. Today the kitchen smells like Thanksgiving. 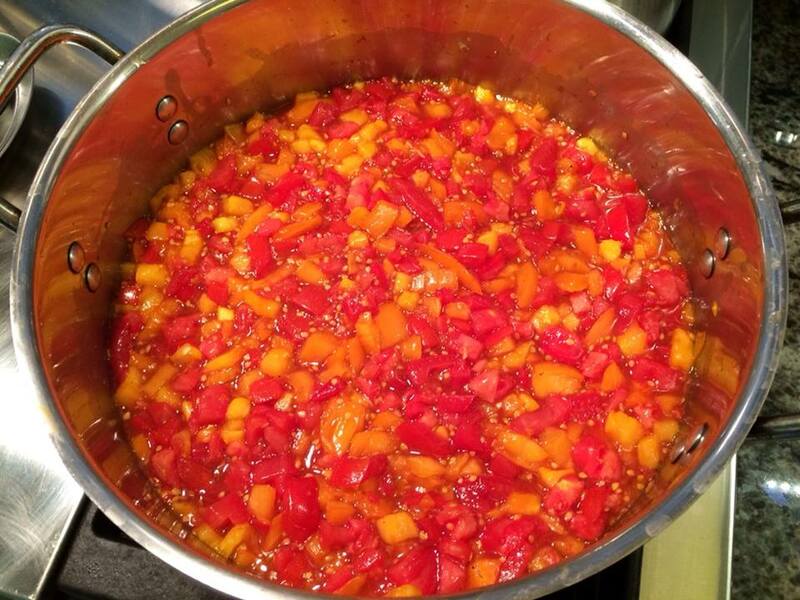 We are working on our second batch of tomato jam. Seasoned with ginger, clove and cinnamon, it smells like pie. It’s cooking down right now, thickening up with each minute that ticks by. In about half an hour I will ladle it into those jars and then immerse the jars into the hot water bath. Then it’s ready, ready to be enjoyed. And we know there are more tomatoes out there! Thanks Grandma. Thanks Mom. These are good lessons that are still paying off.